Many thanks to Scott Fleishman for coming to my art studio, going to Barre to speak with my family, and then coming to one of my speeches up in Swanton in order to do a story on the WCAX Channel 3 News! You can watch the segment here! Dave Gram asked me to come join him for a segment on the Dave Gram show on WDEV radio station in Waterbury, VT, and I said yes! It was a great interview that you can hear on the podcast here. 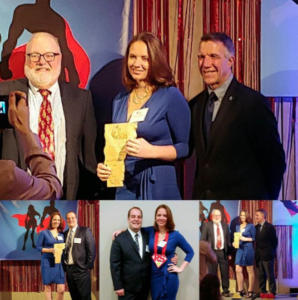 I was nominated by people in the community and then chosen by a panel of judges to receive the Rising Star Award by the Vermont Business Magazine. This award recognizes Vermont’s Top 40 Under 40 for “their commitment to business growth, professional excellence and their communities.” Check out my interview in the Magazine here. 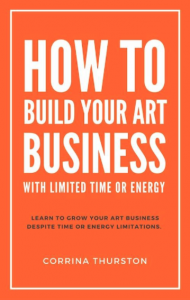 My first book, How To Build Your Art Business with Limited Time or Energy, is listed as one of the “Best Books for Artists” according to Artsy Shark. Check out the whole list here. Don Victor interviewed me for his podcast, Drawn To Win. We talked about my artwork, art and business, and little about our favorite foods. Check it out here (#45). I was interviewed by Rachel Jones for the Money Issue of the Seven days, which you can read here: Artists & Money: Three DIY Ways To Make It. My first book, How To Build Your Art Business with Limited Time or Energy was featured in an article in Ann Kulberg’s COLOR Magazine. I met with writer Carolyn Shapiro on October 26th, 2017, for an interview for Take Magazine, a magazine that features arts and culture in New England! I was interviewed by Sadie Williams for the Seven Days newspaper in August 2017 for their annual Animal Issue! 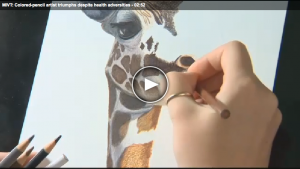 You can check out the online version of that article here: Artist Finds Her Niche Drawing Animals. 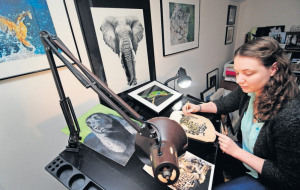 Check out this article, Portrait of the Artist, written by Steven Pappas in the Times Argus about me and my artwork! Front page of the Times Argus weekend paper, February 2017. Thank you to WCAX and Gina Bullard for coming to my studio and interviewing me for their Made In Vermont series! Check out the article and video here! My Cooper’s Hawk colored pencil drawing is featured in the August 2016 edition of the North American Falconers Association’s monthly publication! Carolyn Edlund, executive director of the Art Business Institute and founder of Artsy Shark, interviewed me about starting my art business with limited energy. You can read my interview here! 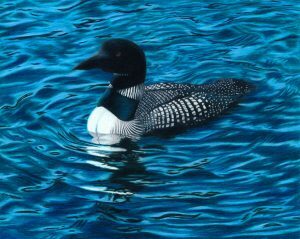 My Common Loon colored pencil drawing was featured in a critique in the June 2016 issue of COLOR Magazine by Ann Kullberg, a well-known colored pencil artist, teacher, and founder of the magazine. My colored pencil drawing, Arctic Tern in Flight, is in the annual magazine publication CP Hidden Treasures Vol. III, full of colored pencil artwork from around the world. My colored pencil drawing, Dolphin, is featured in the annual book CP Treasures Vol. IV – Colored Pencil Masterworks. 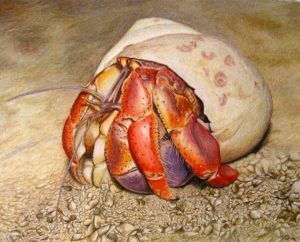 My Hermit Crab colored pencil drawing is in this annual magazine publication, CP Hidden Treasures Vol. I. In 2011, not long after I started drawing and when I was still undiagnosed, I was interviewed by the Times Argus about how I started drawing after falling chronically ill. In 2011, similarly to the Times Argus, The World newspaper also did a story about how I became ill and started drawing as a therapeutic outlet.